Geoffrey Goldstein loves his Buster Cube! The Buster Cube, an inter-active dog toy that originated in Denmark and took Britain by storm, is now available on this side of the Atlantic. Unlike tug-type toys which are only good if someone is on the other end, inter-active dog toys such as the Buster Cube are designed to challenge a dog by making him use his “Grey” matter to figure them out and then to reward him when he does. 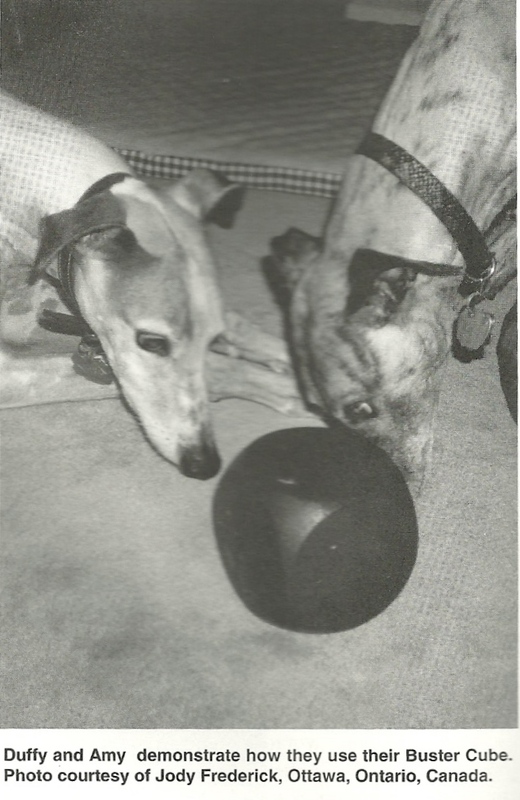 Dogs Today, a British dog magazine, featured the Buster Cube on its May cover and proclaimed it the winner over a number of other dog toys tested. 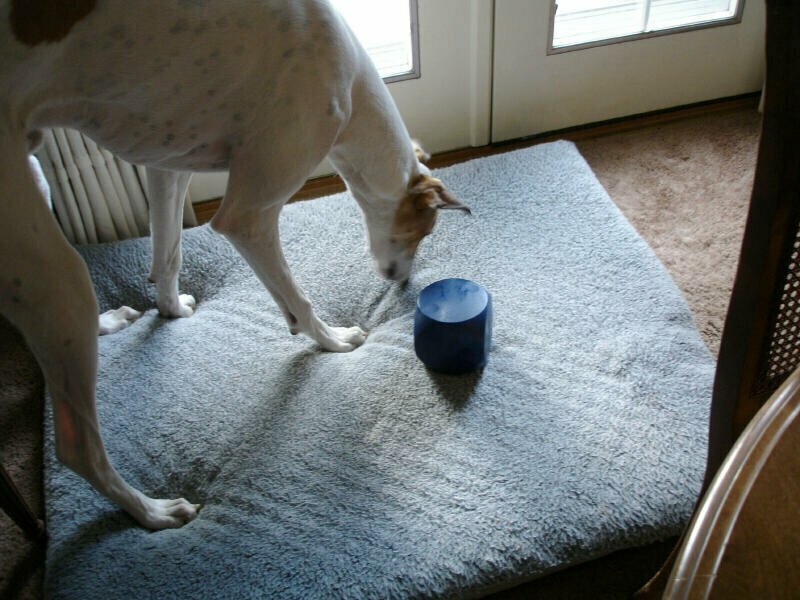 The Buster Cube, designed with a real understanding of how reinforcement works, houses a “honeycomb” interior into which dry food such as kibble or small biscuits is dropped. As the dog plays with the Buster Cube, this food drops out. In a related article, Dr. Peter Neville, British veterinarian, author, and Director of the Centre of Applied Pet Ethology in Tisbury, Wilshire, U.K., highly recommends the use of the Buster Cube with dogs that suffer from separation anxiety. He describes it as “the perfect occupational therapy for the home alone dog” and goes on to say, “the Cube appeals to dogs’s basic instincts and keeps them actively playing for as long as they are interested, which is usually until it is empty and doesn’t rattle when rolled or pushed.” He concludes by stating, “For the family dog, the Cube is worth every penny if you’ve got a bored or destructive dog or just want to keep him occupied and happy when you’re away. With some clients who came seeking help with serious dog problems, my COAPE colleagues have found that the Cube is all that’s needed to overcome separation anxieties and boredom….” In a case study involving two Labradors who suffered separation anxiety when their owners left for work, the whining and destructiveness stopped and they appeared “positively delighted” for their owners to leave so they could be given their Cubes. This is not a sharing type toy, however; each dog should have his own Cube so there is no jealousy. Also, since the Cube contains food, owners must remember to deduct the food they put in the Cube from their dog’s daily food allowance. On a rating scale of 1 to ten, the Buster Cube received the following rating from Dogs Today: 9 out of ten for ease of filling; ten out of ten for attention span for dog; 8 out of ten for human irritation factor (noisy but worth it) and for durability; and 9 out of ten in value for money. The retail price of the Buster Cube averages about $25.00; however, UPCO in St. Joseph, MO (Tel. 800/254-8726), has advertised the Buster Cube in their 1997 Winter Catalog at a discounted price of $14.95 each or 3 for $40.50 plus mailing costs. (If ordering, ask for Item No. 11000). If there were casinos specifically for dogs, what would they be like? I envision stretches of luscious green carpeting, fire hydrants conveniently placed at every Black Jack table, tokens made of rawhide, and rows upon rows of Buster Cubes! That’s right. I see the Buster Cube as the dog-equivalent of a slot-machine. We humans insert a token, pull the arm, and hope for a jack pot of coins. With the Buster Cube, the dog rolls the Cube, hoping that its effort will pay off in kibble. I first saw a demonstration of a dog using the Buster Cube at obedience class. The instructor’s cocker spaniel, Penny, was batting around a blue object and eating the pieces of kibble that fell out when the Cube tossed or turned a certain way. Penny made it look easy and fun yet her focus on the Cube was intense. Because the instructor touted the Buster Cube as an ideal toy for dogs that suffer from separation anxiety, I decided that I must have one for my two greyhounds. I was eager to let my greyhounds, Duffy and Amy have a go at it. I unpacked it from the box, read the directions and filled it with one cup of their kibble, and then placed it on the floor in front of the two curious faces. Although this new object intrigued them, they had no idea why I was introducing it to them. Duffy quickly figured out that there was F-O-O-D inside, but he had no idea how to get to it. In frustration, he tried to chew apart the Cube in an attempt to get his prize. But the Cube’s designer must have known that dogs would try to destroy it. Fear not: this toy is big and strong enough that even a greyhound can’t get its jaws around it to tear it apart. Realizing that my dogs needed help, I gently rolled the cube across the floor. Instant pay dirt! Two pieces of kibble fell out and the two needle noses reacted in an instant. But they still had no idea what was going on. I rolled it again and more food fell out. The hounds descended upon their reward once more. We continued with this pattern. I rolled the Cube around the room and emptied the entire contents for them. By the end of the first session, Duffy knew that he could roll it himself and get the treats. Whack! Roll! Reward! After that light bulb went on in his head, he progressed very quickly and now has his Ph.D. in Cube-ology. He unloads one cup of kibble from the Cube in less than 20 minutes. And, he snaps out of a deep sleep if he hears that familiar rattle of his beloved kibble-filled Cube. Amy, however, has had more difficulty in grasping the concept of the Buster Cube. She is a very gentle greyhound that thrives in a “follower” rather than a leader role. Although she enjoys treats, she would not move mountains to receive one. If the food is not easily attainable, she will not knock herself out to get it. Amy definitely understands that food comes out of the Buster Cube, but she has not learned that she is the one that can control it. She eagerly stands by and picks up the treats if someone rolls it for her, but she has not progressed to taking the Cube into her own paws and giving it a roll. I believe that, with practice, she will eventually learn the rules of the game. I bought the Cube with the intention of using it to keep the peace when we leave one dog behind. However, this wonderfully creative toy will entertain your dogs and make them use their brains. The Buster Cube provides mental exercise and I believe that couch potatoes everywhere can benefit. The Cube makes a very loud rattling noise when there is kibble inside. This might startle your greyhound, especially if it is shy or afraid of loud noises. You will need to show your Greyhound how this toy works. Have patience and don’t give up too soon. It might take your dog a while to figure out that he/she is in control of the food output. There are two levels of difficulty. Set it to “minimum” and slowly work to “maximum” as your dog becomes more adept at emptying the Cube. Take cover and put your grandmother’s fine china in a safe place. The dogs can get very exuberant and sometimes reckless when playing with this toy. The Cube rolls better on carpeting than it does on smooth floors. It also makes less noise on carpet. If you have more than one dog, give each one a separate turn to play with the Cube. This is not a multiple-dog toy and doesn’t seem to work as well as a group activity. Each dog will need an opportunity to experiment with the Cube in the beginning. Monitor your dog’s diet! If you put a cup of kibble in the Cube, then subtract that amount from your dog’s meal.